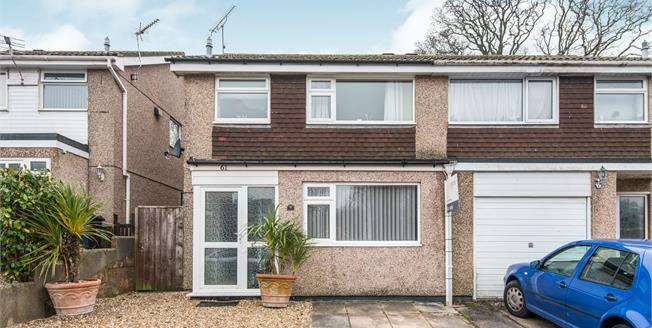 Constructed in approximately 1978 this semi detached family home offers good size living accommodation including an open plan galley kitchen/sun room/dining room, four good size bedrooms, family bathroom, off road parking for two cars and an attractive decked rear garden. The property is situated within walking distance to Gatehouse primary school and Dawlish Community College. Internal viewing is recommended. Textured ceiling, Upvc double glazed window to rear, range of matching wood eye level wall and base units with roll edge worktop over incorporating a stainless steel single sink and drainer with mixer tap, tiled splash back, plumbing for washing machine , space for cooker with extractor hood and light above, space for tumble drier, dishwasher and upright fridge/freezer, power points, breakfast bar with radiator beneath with arched recess through to lounge, wood effect vinyl flooring. Textured ceiling to coving, Upvc double glazed window to front, radiator, walk in wardrobe with hanging rail and storage space below. Textured ceiling, Upvc double glazed window overlooking the front towards the green, radiator, power points, fitted bedroom furniture comprising of two double wardrobes with cupboards over, two display corner shelving, six drawer units. Textured ceiling to coving, Upvc double glazed window overlooking the rear garden, radiator, power points. Textured ceiling to coving, Upvc double glazed opaque window to front, three piece white suite comprising low level WC, pedestal wash hand basin, part tiled surround, panelled bath with electric shower over, fully tiled surround, cupboard housing gas boiler serving domestic hot water and central heating, click and lock wood effect flooring. To the front of the property there is a paved and gravelled driveway, there is a side gate access leading to the rear garden which is fully decked with mature shrub and flower raised rockery, garden shed, raised decked seating area, outside tap, large wooden port as you come out of the dining area, ideal for garden storage or hanging washing to dry.